Last weekend was one of the worst in years at the box office, as major studios avoided it and the fodder the smaller studios sent out landed with a thud. This week, we'll at least have one top-line film to start the reseeding process, as we might very well have only two films worth talking about on Sunday. In the 2000s, Hollywood started reaching out to the video game world as a source of inspiration for films. For the most part, they led to a lot of one-and-out dreck films (DOOM, anyone?) but one in particular has shown a huge amount of longevity. The Resident Evil series brings its fifth film (sixth if we count that animated DVD) in ten years, neither fact of which seem like anything you might have bet on happening when the first one came out in 2002. Retribution is the latest title for the series, which continues the story of Alice as she goes up against the Umbrella Corporation and its army of genetically mutated zombies, although it seems like there wouldn't be much of anything worth fighting for at this point. A decade of global zombie war seems like it would take its toll. Perhaps recognizing that, this film also takes a bit of a step backwards to fill in some backstory, acting as both sequel and prequel, giving us information on how the whole zombie outbreak started. In addition to Milla Jovovich's Alice, it also brings us a few other characters from past films to tell their stories, including Jill Valentine and Michelle Rodriguez's Rain, who you might remember as dying in the very first one so long ago. 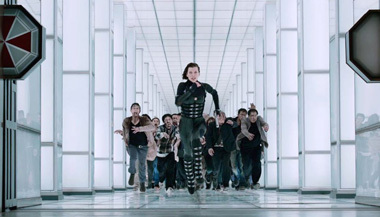 The hallmark of the Resident Evil series has been its over-the-top stylized action and wild special effects, which with these last two films have expanded to the 3D realm. It's also been a triumph of marketing, as each film has managed to start out with a creative campaign that's fed off the film's underlying anti-corporate theme, parodying the slick look of product advertisments, and twisting them into the apocalyptic setting. The films have never been huge domestic earners, but have always had solid opening weekends. The most any of these has earned in the US is $60 million, off a $26 million start. However, with the last Resident Evil, the film's already strong foreign box office kicked into overdrive, bringing in an extra $295 million, a split that even the Ice Age films boggle at. In short, this film is really not for us, specifically. Thank Japan and Europe for this existing, though this should still get its solid first weekend of about $25 million.